Upcoming Workshops Visit Stories by the Sea on Facebook! 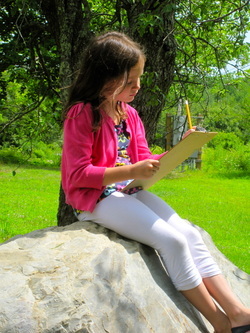 Students will spend time writing and drawing in nature as they slow down to notice the sights and sounds around them. All writing activities will have a primary focus of free expression and fun! Students will also have the opportunity to create story stones or cubes, heart maps, neighborhood maps, and more! The groups' interests will help shape the flow of the sessions. Our workshop series will culminate with a presentation of students' creativity.